Directly offsets Shell’s Groundbirch Montney and Crew’s West Septimus development. TransCanada Nova existing mainline extension to BC Aitken Creek storage will transect Company lands. 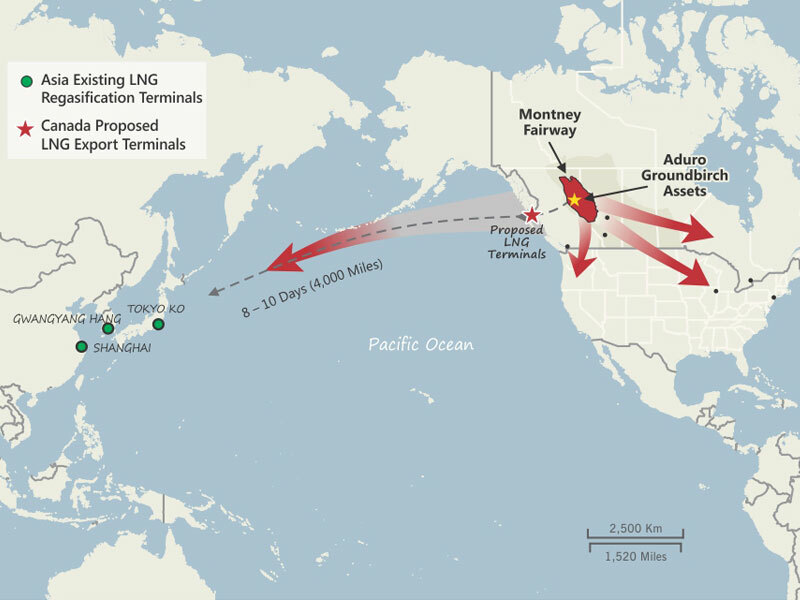 Opportunity for direct access to North American gas markets (AECO) prior to LNG export at lower transportation cost than current fee structure. Proposed TCPL Coastal GasLink route will border Company lands on south. Ownership of facilities and infrastructure between Peace and Pine Rivers provides competitive advantage. 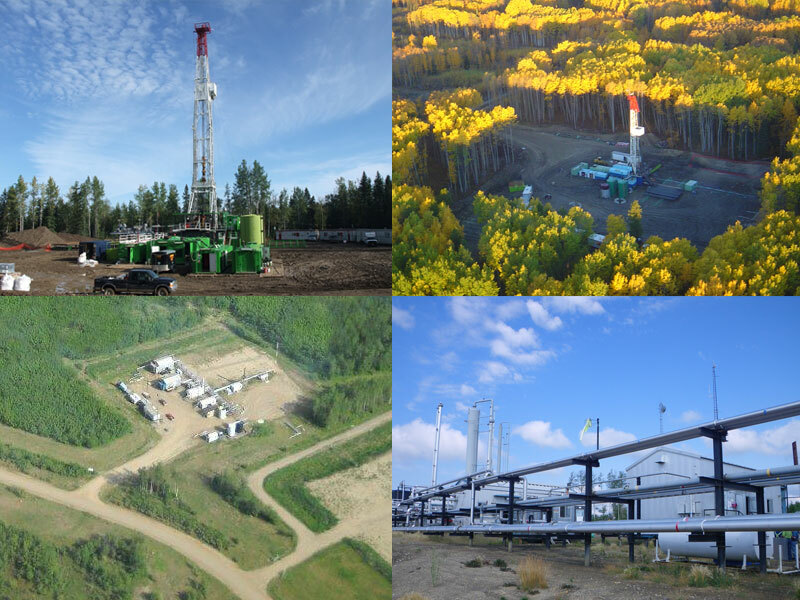 21 wells owned and operated with current production of ~3.5 MMcf/d; majority of production contribution from the Montney Formation. 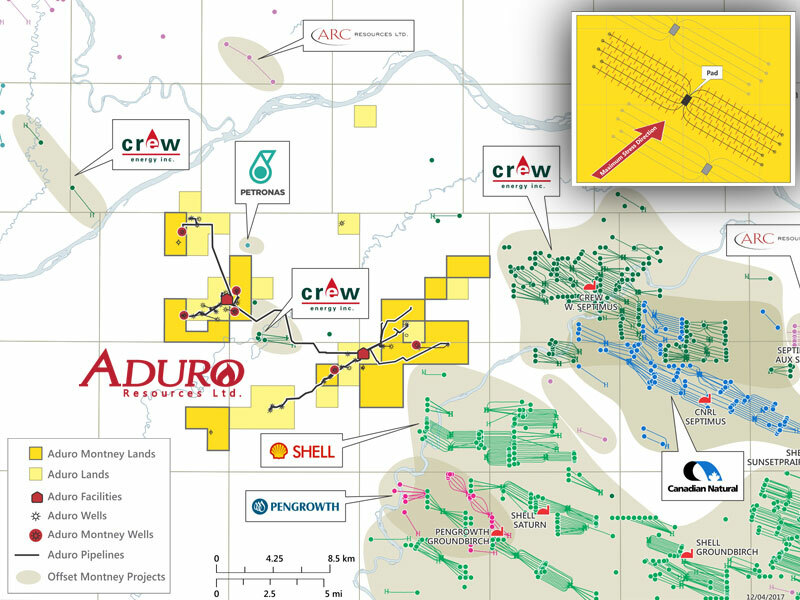 Aduro's evaluator (GLJ) has assigned proved, booked reserves to the asset. 100% current production is operated; 99% average WI in pipeline and facility infrastructure. Company owns and operates two gas facilities with total capacity of 35 MMcf/d and over 100 Km of an associated gas gathering system. Facilities consist of compression, dehydration and liquids separation. Ability to bring additional Montney wells on immediately and determine longer term production performance in a shorter cycle time. Gas facility currently generating additional third party gas processing revenue. Montney horizontal wells from adjacent land are tied into the Aduro gas facility that generates third party revenue for the Company. 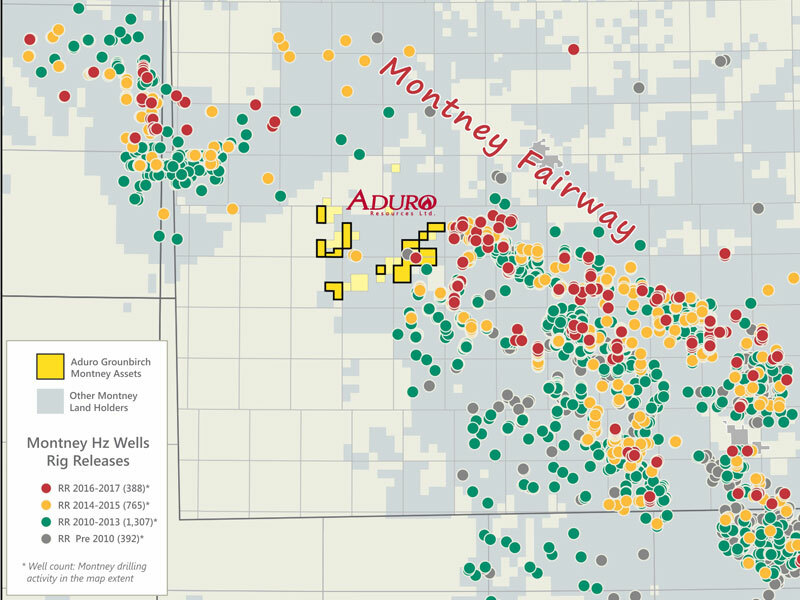 These Montney wells further validate gas & liquid potential on Aduro assets. Porosity ranges from 3.5% to 6.5%. Montney on Company land base is 21% to 31% over pressured. 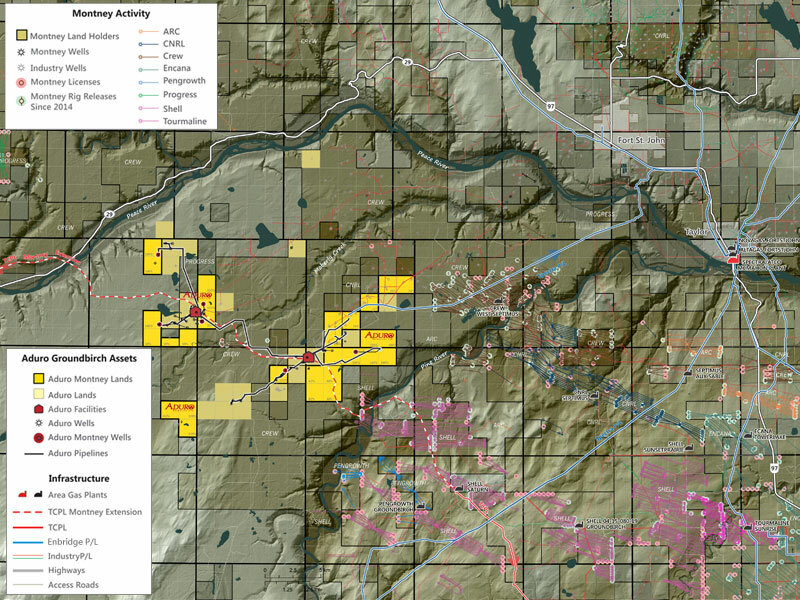 Two horizons of Upper Montney development (up to 10 wells per horizon per section planned). Upside potential by drilling 15-20 wells per section (as per offset operator plans). Significant upside sensitivity to increased well IP rates and gas price. Wells qualify for Deep Gas Royalty Credit. 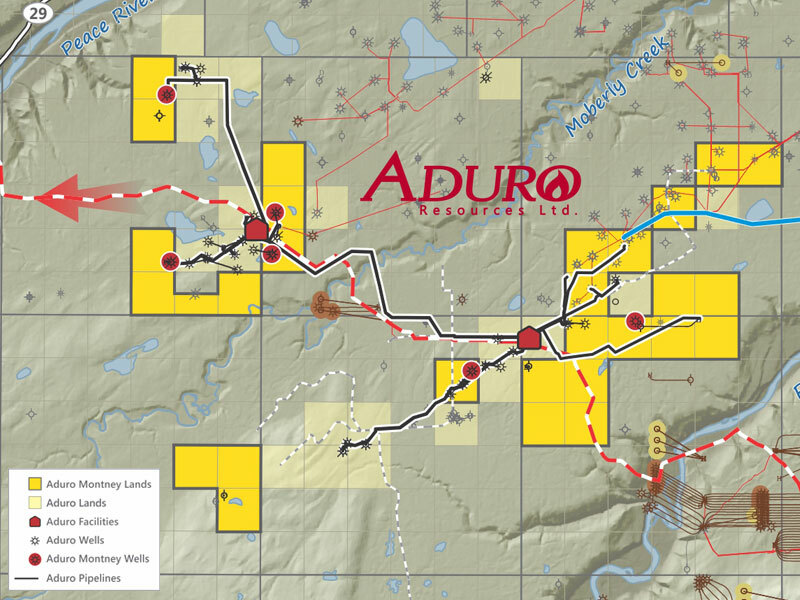 Aduro owns over 15,000 net acres of Montney formation rights in the established Groundbirch field of Northeast British Columbia’s prolific Montney Fairway.